Book a full week during our off season (spring or fall) and we will waive your cleaning fee! 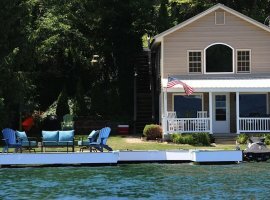 BRAND NEW DECK WITH BAR OVERLOOKING LAKE, UPDATED KITCHEN FOR 2019! INQUIRE FOR ADDITIONAL DETAILS! PROFESSIONAL PHOTOS ON THE WAY! Lake Forest Lodge has a breathtaking view of Keuka Lake and is nestled on 3.5 acres of pines and hardwoods. This property has the best of both worlds as it also has lake frontage. 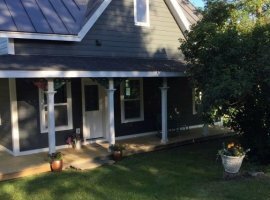 The cabin has 3 levels: the main floor has a great room with gas fireplace, cozy eat-in kitchen, and spacious dining room that seats 10 comfortably.These rooms face the lake and boast an amazing view of Keuka Lake. Also located on the main level are 2 bedrooms and 1.5 baths. The lower level includes a sitting area with full size sleeper sofa, a bedroom, a full bath, and washer and dryer. The third floor open loft has a charming log-framed bed. There are several large decks for relaxation and gathering for meals with family and friends in a private setting. LFL is located on the hillside across the road from the lake, which provides secluded and peaceful surroundings. 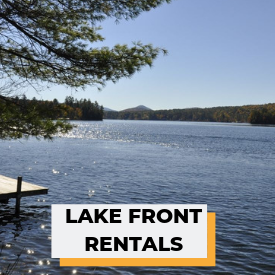 Note: The lake frontage is accessed by walking or driving down our 'steep' driveway, crossing the road and continuing down the common/steep driveway where we have available 2 parking spaces. Approximately 50 stairs will lead you to the scenic deck and private dock. 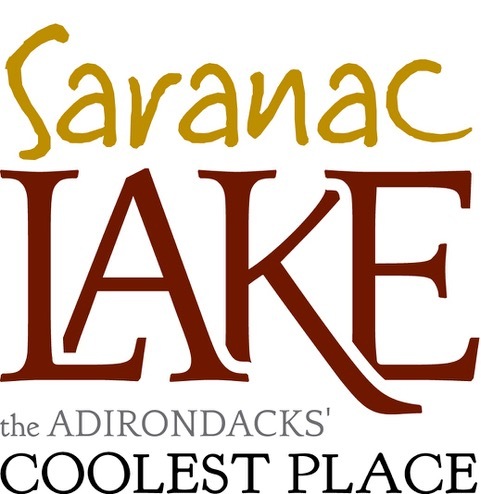 Other Activities Around the Area: Enjoy a variety of restaurants on and around the lake or in the charming Village of Hammondsport. Experience the Finger Lake's finest wines along the renowned Keuka Wine Trail. Stroll along the waterfront and square of Hammondsport while enjoying ice cream. Browse through the antique and gift shops. Take a ride to The Windmill Farm & Craft Market or visit the Indian Pines Farmer's Market for homemade pies, pastries, jellies, fruits and veggies. Watkins Glen Raceway and State Park are approximately 30 minutes away. Take the kids go-cart racing, hiking or biking on the local trails. 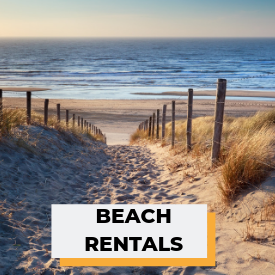 Watercraft rentals are available at the local marinas. 4 Bedrooms, Sleeps 10 Bedroom 1 - 1 king Bedroom 2 - 1 double Bedroom 3 - 1 queen Bedroom 4 - 1 queen Bedroom 5 - 1 sleep sofa /futon Bedroom 3 is a loft with a queen log frame bed. Bedroom 5 is a sitting room with a full sleeper sofa. All bedrooms have cable TV and most are equipped with ceiling fans (BR1,BR 3, and BR4). Bed linens are provided. 2 Bathrooms, 1 Half Bath Bathroom 1 - toilet , combination tub/shower , Main Floor Bathroom 2 - toilet , shower , First Floor Bathroom 3 - toilet , Main Floor Bath towels, hand towels and washcloths are provided for 10 people. West side of Keuka Lake, minutes from Hammondsport or Branchport. 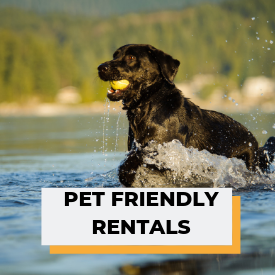 All policies are spelled out in the rental agreement. 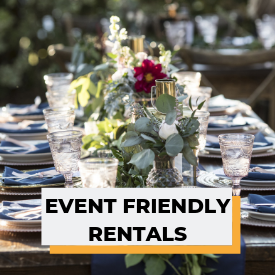 Please feel free to contact owner with any specific questions prior to booking! We had a mini college reunion at the lake and this house was perfect for it. We were close to everything and yet you felt secluded with beautiful views. We had everything that we could need. I highly recommend this house and hopefully we can stay there again in the future. The view of the lake from the deck and the window in the great room is just breathtaking. We spent 3 days and nights at this luxurious log cabin. But it’s more than a cabin....it’s huge! One could almost call it a lodge. It’s fully equipped with everything one would need. The beds are comfortable and cozy. The location is perfect. Yes, if you read the reviews the driveway is steep and there are 66 steps down to the dock but this is what you will probably find in most of the homes located on this lake. This is a little price to pay for such majestic beauty! Thank you Brian for allowing us to stay in your beautiful home. The house is in a great location, however, road work made getting to locations north on the west side problematic. The house was very comfortable and quiet and great for a gals getaway to wine taste and relax. If you go though, bring extra dishwashing pods, as they only supply one. We had 5 people and had to many days of washing dishes by hand. View was lovely of Keuka Lake and handy to Hammondsport, a lovely village with several great restaurants. This is a beautiful house and comfortable for families. The decks are large and connected with stunning views. The front porch is covered and was great to sit on during the few rain storms we had. We had 5 families with ages ranging from 15 months to 72 years. There was a baby gate available and an air mattress, in the main floor master bedroom. We contacted the owner about a parking concern on the lake access section, and it was resoled quickly. There is limited cell phone access, but the internet service met all of our needs. We streamed movies and shows, without a hitch. The dock and lake access from shore were well maintained and convenient. We brought a boat with us, and launched from Jake's Boat Livery. Jake's also stored our boat trailer on site for the week for a reasonable fee. There are wineries, breweries and distilleries very close. We called it our "Reez" trip. 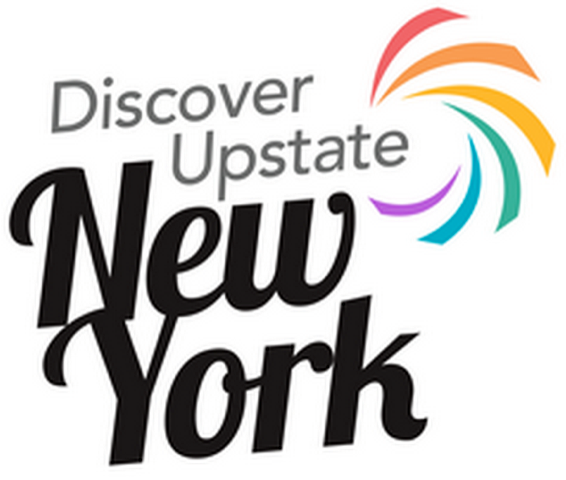 Also, the Gorge at Watkins Glen and the Glass museum in Corning are in east driving distances. The house was clean and well appointed. We didn't want for dishes and the appliances worked great. The fact that there are 2 refrigerators is a major plus! We had more than enough fridge space to for 5+ cooks. The mattresses were extremely comfy. Also, there were enough towels and linens for all. Be aware the two sleeping areas in the basement are not private. One is a sitting room and the other has a WINDOW into the sitting area with shutters over it. The beds sit under the window and every noise in either room can be heard by the other. I am taking one star off for the steepness of the hill. It is extremely steep. The house is up on the hill across the road from the lake. The driveway to the house has a switch back because of the steepness. There is parking at the house, off the lake road and at the top of the steps leading down, down, down, (60+ steps) to the dock. We would leave one car at the lake side parking for driving up and down from house to lake. The 15 month old did not go to the lake from the house (we drove to a public access point in Hammondsport) and the 72 y/o only went down twice. I would go back and rent this property again. I might wait until the youngest we bring with us is about 4 to 5 y/o though. Walking up and down from the lake a few times a day, would wear them out! And the decks are great to sit out on and enjoy the wines we picked up and each other's company. We really enjoyed our time at the cabin. Brian is a great host. He is very prompt with his responses and keeps on top of everything. 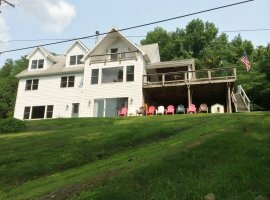 Some things that we really liked - the lake is beautiful, proximity to the wineries, close to a cute town - Hammondsport, the house is really nice and spacious, we loved relaxing on the very large deck for breakfast and during the evening, swimming and fishing off of the dock, and use of the kayaks. The only minor issue was access to the lake as it's down a steep driveway and then another steep access road and stairs to get to the dock. There was road construction during our stay so getting in and out of the driveway and onto the road was not easy. Hopefully, that will be done soon! I would give it 4-1/2 stars if I could and I would definitely consider staying again. We were so happy with the property. We had a small reunion of 8 people and the House was perfect to accommodate that size. The dining room allowed for dinner all together. There are several HUGE decks with beautiful visuals views of the lake. The driveway is steep so be mindful. Brian was great at getting back to me within hours for any question or concern. I only wish we could’ve stayed longer! Spacious, has everything you need and more. Secluded up in the woods and lake access across the road, perfect combination. Highly recommend. We spent a week at this cabin and were delighted with the cabin and overall area. The cabin is spacious and well appointed. There was plenty of room for relaxing, playing games and hanging out on the deck. The cabin sits above the lake and has a great view but is very quiet. The dock is very nice and the lake is great. We rented a boat for two days from Keuka Watersports and had a great time tubing and skiing. Brian was great to deal with and ensured everything was in order for our visit. This was one of the best vacations we have ever had. My family decided to meet at the Finger Lakes for a few days this summer. There were 9 of us spanning all ages including a 1 yr old, a 6yr old, a 10 yr old, their grandparents, and everything in between. I was wondering if the house would be as pretty as it is in the pictures....it definitely is. Plenty of space to spread out. Some toys and games. We did all of our meals at the house and found the items in the kitchen met every need we had. My mom seemed very happy with that! We spent an entire day on the deck playing games and hanging out. The views from the deck are really beautiful. You almost feel like you’re up in a treehouse. I think it would be great in the fall, too! We used the kayaks and there were several sizes of life jackets (even for the little one). There is a private pier that goes with the house. The kids were able to fish off of it and we could see fish swimming around because the water was so clear. There are quite a few piers all in the same area. The one thing that should be considered when renting this house is the driveway and walk down to the lake. The reviews are not kidding. It’s a bit steep. The kids and I did the walk up and down a few times but it was certainly an incline. To get to the lake, you walk down the driveway, cross the street, walk down another equally steep walkway, and then go down about 60 stairs. As stated in other places, you can skip the two inclines and drive down (and back up) instead. I guess our social media pictures show how nice this house really is because we already have a couple friends who also want to book it. Lastly, I can’t say enough about the quick and easy communication with Brian. He is very responsive to all questions and has good information about the area! We would love to visit this beautiful place again! Me an my family visited this wonderful home, an loved our stay. The house was very roomy, quaint , clean , an very nicely decorated. The surrounding area has wonderful wineries, breweries an fantastic places to eat. The lake is also gorgeous for the kids an our family to enjoy. Hammersport is a beautiful little town as well. We will definitely be back, an I highly recommend this property for others to enjoy. Thanks Brian for renting us your property, my family had a fantastic vacation. Also visit Watkins Glenn falls, it's not far away an a beautiful day trip.